Automation for an efficient pharma production. Rely on cutting-edge industrial robots or on Pester's robot technology that comply with all your requirements. Diverse availability – design your palletizer according to a modular system: from a single-station palletizer to a fully automatic palletizing system with Track & Trace components. You even have the option of using our robot technology as a depalletizer at the beginning of your packaging line. Rely on intelligent automation for your pharma line. New, fully automated depalletizing generation. High-precision handling with innovative gripper technology for vials, ampoules, inhalers and auto-injectors. 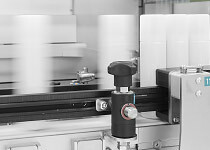 Reliable position detection via camera systems integrated into the robot ensures the exact feeding of your pharma products, to the filling and packaging line.